Things to Come is an early and largely unheralded masterpiece of cinema and one of the all-time great science fiction films. H.G. Wells, the famed novelist, actually wrote the screenplay adapted from his book The Shape of Things to Come. It’s one of the most ambitious films ever made and tells the story of a fictional city in England from 1940 to 2040 – a hundred-year journey of technological and political progress filmed with the most advanced special effects and production design of its time. The English city of “Everytown” is a not-so-subtle double for London. The film begins in 1940, when the world was at the brink of a war (and remember the film was made in 1935, four years before WWII broke out). Though most people knew a World War was imminent, the damaging effects nobody could predict, and so when war does break out in the film and literally destroys the world, we get to see an extreme view of our future. The second stage of the film takes place in 1970, when the world is still reeling from the destruction caused by the war. The world is divided into smaller warring communities – a world where scarce commodities like gas, oil and water are the prime necessities. Communication and technology have disappeared, and people live spartan post-apocalyptic lives of need. Out of this environment emerges a tyrannical Nero-like despotic leader, Rudolf, who leads Everytown into battle against its neighbours. But when a member of a more advanced group arrives to the city in an airplane, hope of a better future is clear on the horizon. The final chapter fast forwards to 2040 where it’s a completely futuristic world of peace. But the progress that brought the peace is moving too fast for some. A backlash against the technological advances ironically creates more tension, and a new rebellion moves to reverse technology and revert society back to where it was. The film climaxes with a riot as the leaders of the city launch the first manned mission to the moon. Despite some clunky on-the-nose dialogue, the film is highly entertaining and a technological marvel. Wells writes his dialogue in the form of ideological speeches warning viewers about the dangerous world we’re headed towards. The ideas and themes of war and the irony of progress and conflict are simplified, but a 1935 pre-war point of view makes it remarkably profound and thought-provoking. But the production value is the star of the film, including the design, editing and cinematography. More impressive is that it’s a wholly British production with no Hollywood ties. It was directed by the renowned production designer William Cameron Menzies, who would go on to win an Oscar for designing Gone with the Wind and shooting the famous Burning of Atlanta sequence. He would also direct the sci-fi classic Invaders from Mars in 1953. 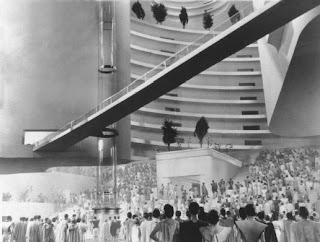 The staging and set design in Things to Come are unbelievable and rival any film of its day or since. The design of the demolished city bears a striking resemblance to the bombed cities of Europe after the war – Berlin, Tokyo, etc. – and matches the destroyed city designs of Full Metal Jacket and Saving Private Ryan. The futuristic city in 2040 is even more impressive. Model work, matte photography and rear projection imagery are seamlessly combined to create a visually stunning future world. Menzies chooses a series of awe-inspiring frames that would set the bar for all other science fiction films to come. Legend Films distributes the fine Ray Harryhausen-restored DVD. I highly recommend picking up Things to Come either to complete your science fiction collection or to start it. If you’re a cinephile, this needs to be on your shelf.